Errol: Hello! And welcome to another year of Nanotoons! We have a whole host of comics in store for you. I am super pleased that Debbie Ohi is joining me again this year. Last year I was all on my lonesome, and that was difficult! Huzzah for Debbie Ohi! There will be new things afoot, hopefully, but I have written up a prologue to tie last year to this year. So if you are wondering why Debbie is only listed as the editor in the credits, rest assured! She is writing the script for the month of November as we speak! 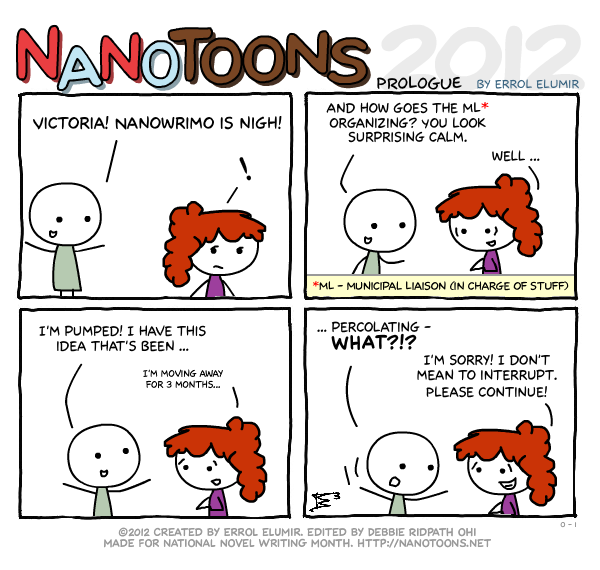 For those new to Nanowrimo, Welcome! I hope we can inspire you this year to write more! Take care and by all means, add me as a buddy.